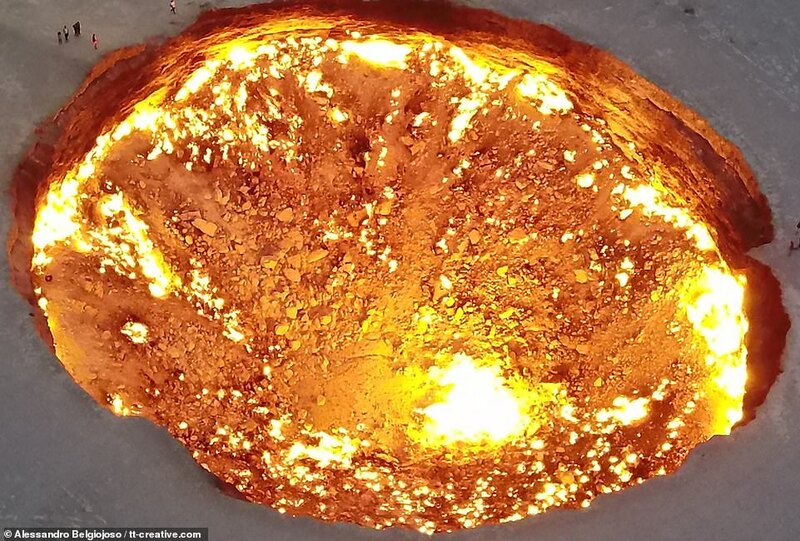 Your typical drone can withstand temperatures of up to 40C (104F), so it's just as well this one didn't get too close to a crater nicknamed 'The Door to Hell' - where the heat can reach 1,000C (1,830F). 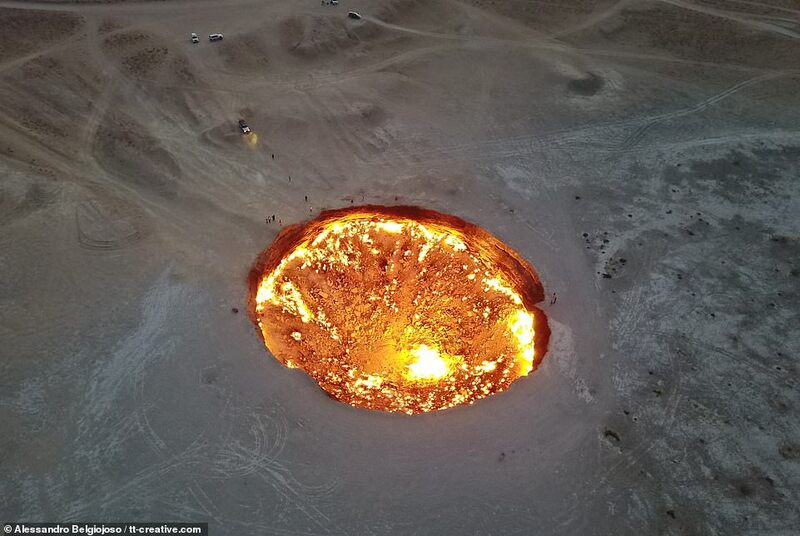 Aerial footage has captured incredible views over the apocalyptic Darvaza crater, a flame pit in the middle of the Karakum Desert in Turkmenistan, that has burned for more than 40 years. 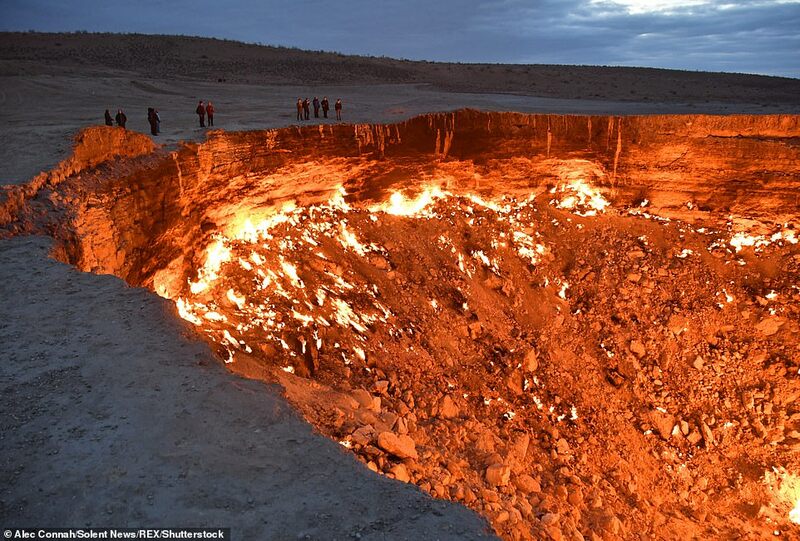 The 69 metres-wide by 30 metres-deep crater was formed when a group of Soviet engineers exploring sources of natural gas saw their rig collapse – creating the hell mouth. Fearing dangerous gases would be released into the atmosphere, they set it alight in the hope it would burn off in a few weeks. That very clearly didn't work. It hasn't stopped burning since that day in 1971 and has become a major tourist draw to the sparsely populated Derweze region. Drone operator and photographer Alessandro Belgiojoso captured the stunning high-definition footage of the eerie sight. He said: 'The crater's story is fascinating. The story goes that at the time of the Soviet Union, Russians heavily drilled the desert seeking natural gas in the fourth richest country in the world for natural gas reserves. 'Some miscalculation led to machinery, and most probably operating engineers, falling into the ground. 'As gas poured into the atmosphere - making it impossible to live in small villages even at a great distance in the desert - the best option was to light up the gas and wait for the gas field to dry up. 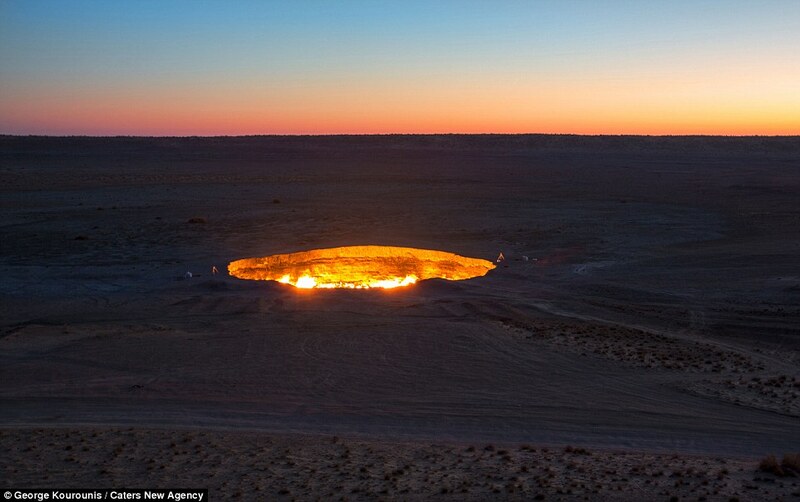 Despite this, the site, 150 miles from Turkmenistan's capital, Ashgabat, has become a draw for hundreds of curious onlookers each year, keen to catch a close-up glimpse of the mesmerising fire pit. In 2013, a world-renowned explorer became the first person to descend into The Door to Hell. 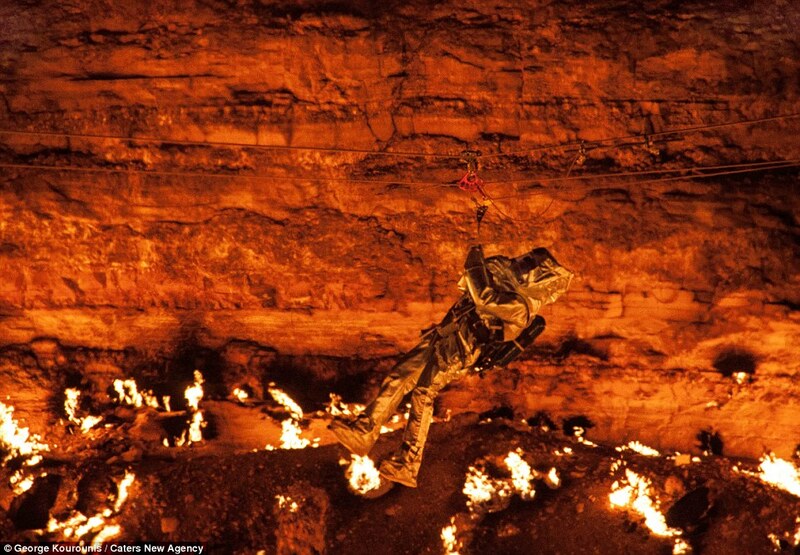 George Kourounis, 44, rappelled 100ft down into the crater and walked across its surface. The Canadian was part of the first-ever expedition into the flame pit. When Mr Kourounis, from Toronto, heard a rumour the Turkmenistan government was planning to extinguish the flames, he decided to up his efforts to visit the location. In the past he has taken on volcanoes and revealed that his aim, as well as to walk on the surface of the fire pit, was to collect samples of dirt to be analysed. He completed the challenge in the winter of 2013 and it was later discovered bacteria was present, despite the hot, methane-rich environment. He was pictured at the time dangling precariously above the crater wearing a heat-reflective suit, breathing apparatus and a custom-made Kevlar harness. Mr Kourounis would stay in the crater for around 15 minutes before being pulled out by the rigging team. He said: 'Since this was something nobody had ever done before there was a lot of uncertainty and questions. How hot was it at the bottom? Is the air breathable? Will the ropes survive? What if something goes wrong? 'Nobody knew the answers - not even me. When I actually set foot at the bottom it was an overwhelming feeling.